This ornament is absolutely adorable!! I can't wait until my granddaughter sees it. It's a Christmas present. 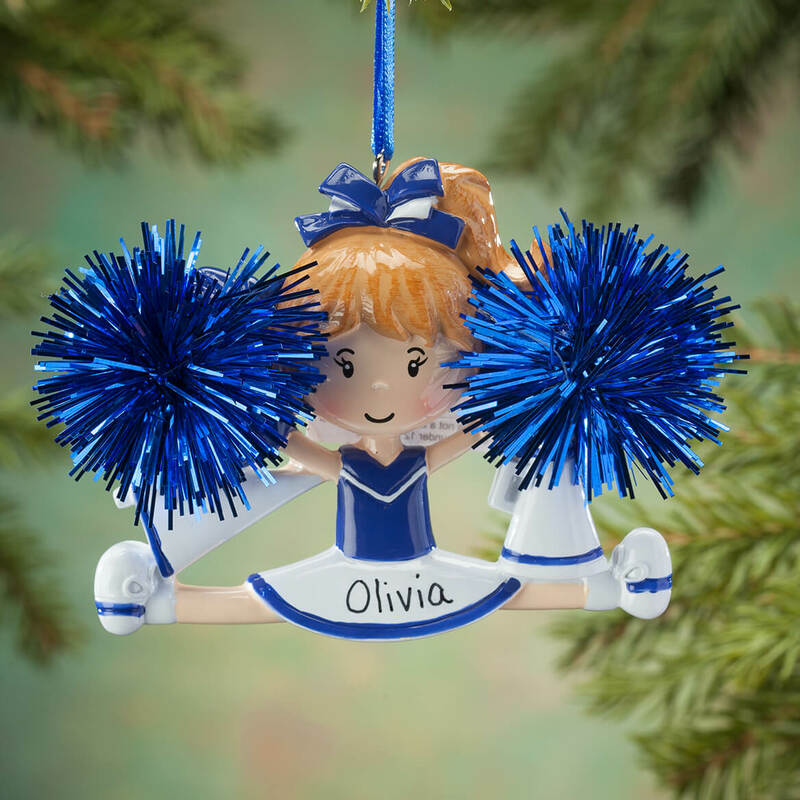 This ornament was very cute and colorful - love the sparkly poms!! Gave it to my granddaughter she is a cheerleader. She loves it especially the same color as her team ! She is into cheerleading and purple is her favorite color! Adorable, and is exactly as pictured. This was bought as a Christmas present for my granddaughter. She hasn't received it yet, but I'm sure she will like it and hang it on her tree. No Question - She's A Cheerleader!! If there was anything that fit my Great-granddaughter it's this ornament. She is so popular with her school mates and a real leader. For 11 years old she has been a delight to our whole family. Cute, but I wish there choices in hair color. 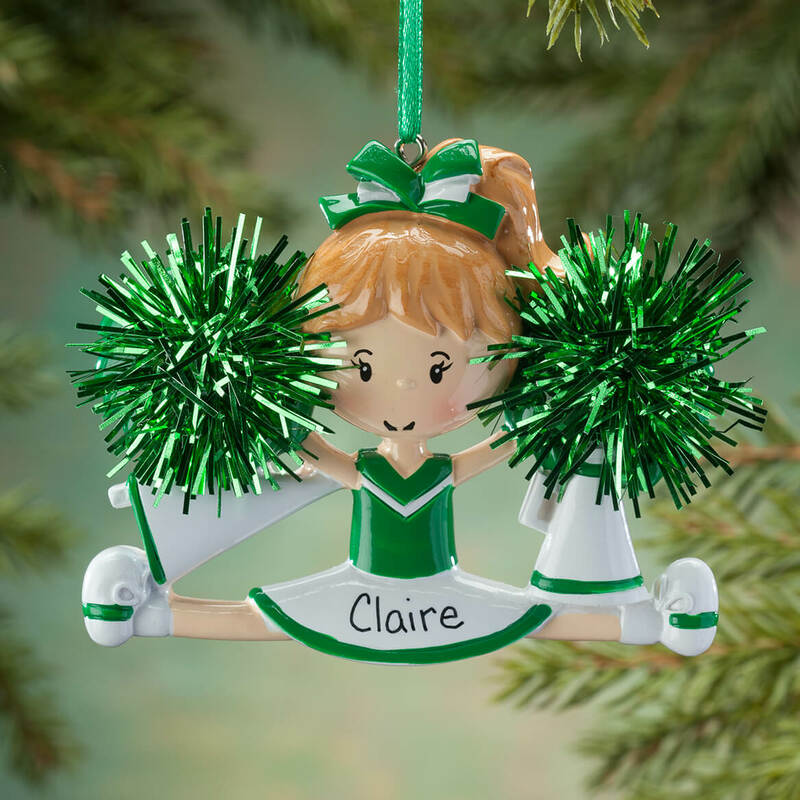 Granddaughter is a cheerleader and this is the first ornament that i found with her school colors and to be able to be personalized with her name. Also my 8 year old grand-daughter learned to be a cheerleader this year. My friend was a cheerleader when she was young, but she continues to encourage me and others. I liked it. however, I was relying on your statement in your catalog that you were giving FREE SHIPPING on your merchandise total of $39 or more. I certainly qualified for that as my order was over $200, and I was charged $$15.99. I do not think I will be ordering from miles kimball again. Granddaughter is a cheerleader! She will love this! 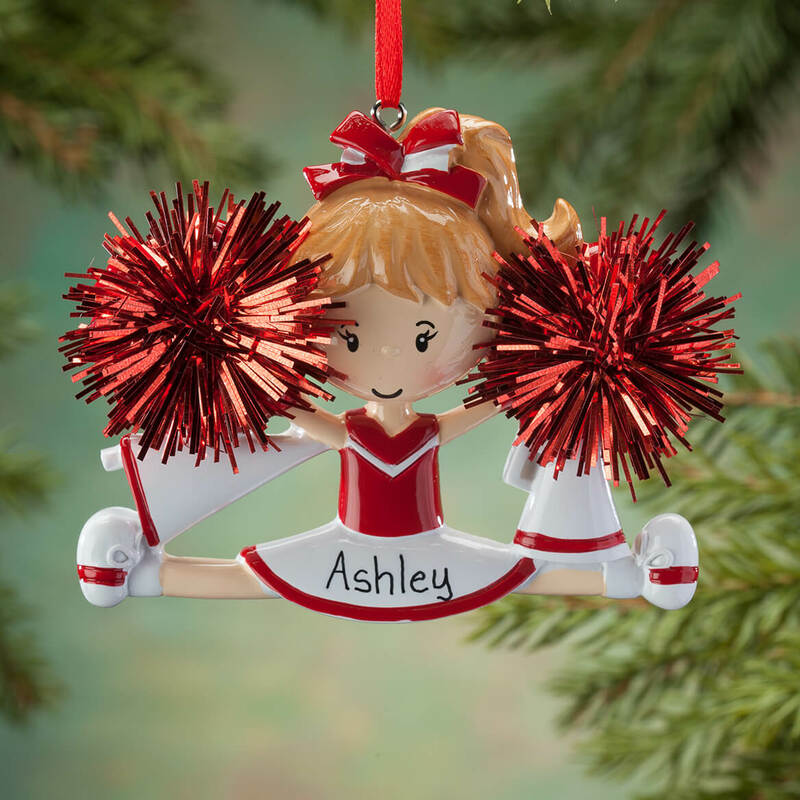 My great granddaughter is a cheerleader and I thought this would be a nice item to give her for her Christmas tree. I always get my grandkids a personalized ornament every year. Grandaughter is a cheerleader this is perfect for them. My 5 year old Granddaughter LOVES to cheer!! My Granddaughter is a cheerleader and these are her school colors. Perfect! My granddaughter has been the head cheerleader for her school,s varsity sports groups all of last 3 years and lead line dancing. Great Quality and It’s adorable! I choose purple for grand daughter. My granddaughter gets a special ornament every year. She is only eight, but she has been in the future cheerleader program for two years and I thought this would be special for her this year. She is so eager to be an actual cheerleader. My grand daughter will love this - she is a cheerleader. Granddaughter is a cheerleader this year. Do you have an orange cheerleader? BEST ANSWER: Thank you for your question. Unfortunately no this does not come in orange. We hope this information will be of help to you. Can the skin color be changed? Another site you are able to choose skin color and uniform color. BEST ANSWER: Thank you for your question. Unfortunately we do not offer skin color change at this time. We hope this information will be of help to you. I didn’t see options for skin color, only color options for uniform. Too bad there’s not. Would be nice. No, only the color of the uniform.